As promised, here is my neighbor Pipsqueak Fiddlestick's romantic snowy garden in Caledon Wellsian. She's an interesting one; when I asked her about the summer version, she made gleeful reference to kissing near the deadly nightshade. "It'll be somewhat Shakespearean," she said, "love and a little danger." This garden has romance in the cold. I like the creative mixing of romance metaphors; instead of dancing near a fireplace, Pipsqueak has a number of places to dance knee-deep in the snow. 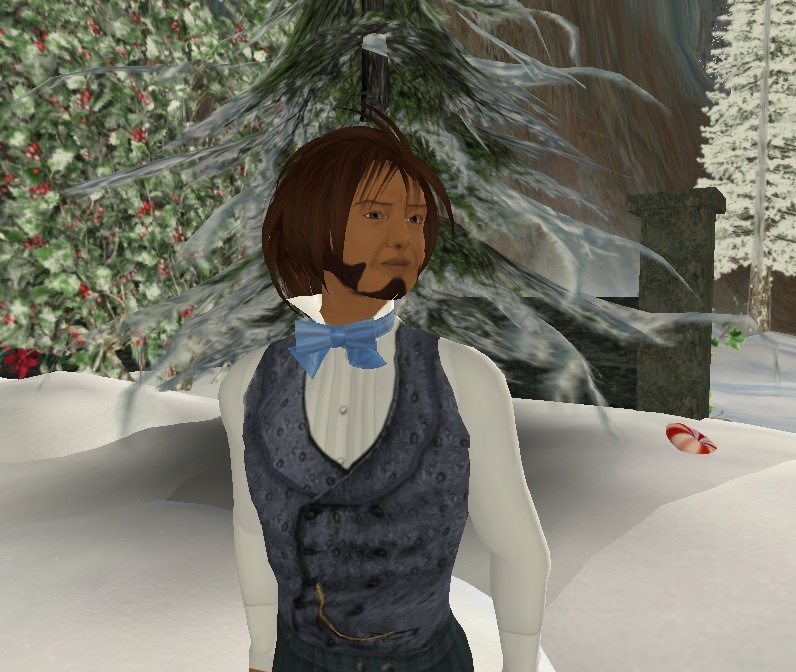 What is the nature of love in Second Life anyway? Recently, a few fashion bloggers have discussed the sad turn of their SL love lives. It's all situated so deeply inside of the technology that the two are inextricable. Do you offer to let them see where you are on the grid? Do you demand reciprocation? Do you go through a formal "partnering" ceremony? Does s/he have any alts? If you cyber...do you fake it? ...Does HE? Because I'm married IRL, I've got a pretty strong line dividing reality and the playful way in which I treat Second Life relationships. Therefore, when I needed to find someone to pose with me in a romantic garden, I chose a guy who is my defacto little brother. I've known Giuseppe Spicoli for a long time IRL, and know that while he'd probably enjoy the process of virtually dancing with my avatar, he isn't going to take it to the LUUUUURV place. Giuseppe's been around the grid since early 2006, and lives in the Wastelands. He's got the big drive-in theater and graveyard, and spends his time hosting variety shows in his postapocalyptic coliseum. He actually went and invested in some Victorian dress-up clothes so that he could show up as my date for Caledon functions. We traded adolescent comments about poseballs as we tooled around the garden. At least this time I didn't put on my boy avatar and make Giuseppe play the bottom. :D He's long suffering, is Giuseppe. All adolescence aside, I really enjoyed dancing. It feels tender to look at the screen and squish someone that you care about. I guess this is how SL and RL intermingle; even if it is an extremely vicarious experience to watch yourself slow dance on the screen, it's still slow dancing, and you can't help feel like you're dancing with someone. You are; there's a ghost in their shell. I guess that's how some SL relationships actually work. I remember my first dance...and I was amazed to actually "feel" it. Hoshit, grady, you're working your way through my blog! And you must be sittin on my shoulder all the while lol. I am just in awe here. I love to look at pictures, and your blog is total eye candy overdose. aw, that's totally kind of you to say. <3 i like eye candy too, and am addicted to blogging it.